The No. 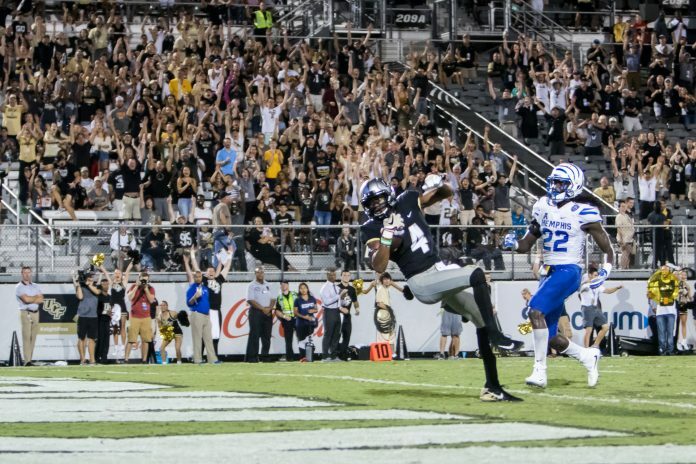 10 UCF Knights escaped a nightmare scenario in Memphis when they defeated the Tigers and halted their 12-game home winning streak with a 31-30 fourth-quarter comeback. Everything went wrong in the first three quarters for the Knights: numerous penalties, missed tackles, and bad plays made the top-ten team look bottom-tier. Memphis’s Darrel Henderson couldn’t be stopped. At the start of the second half, the UCF defense made adjustments and stuffed Memphis ever since. A slow close of the scoring gap broke when McKenzie Milton ran in for a touchdown to take the lead 31-30. Three fumbles within minutes changed the atmosphere in the fourth as UCF recovered against Memphis, then lost, then recovered again. Stay tuned for a full game recap.